I previous wrote a rather sentimental tribute to Mayberry and The Andy Griffith Show–and praised the themes of Barry Manilow’s CD, Fifteen Minutes, on the corrupting influence of fame–and strangely enough, I’ve now found a movie that combines the two! 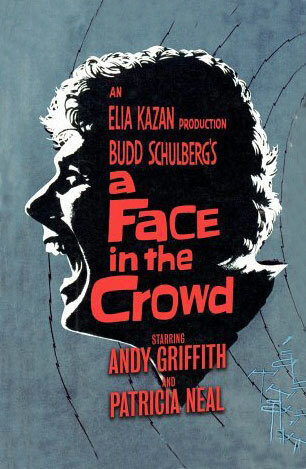 A few years before landing in Mayberry, Andy Griffith starred in A Face in the Crowd…and was not playing the Sheriff Andy Taylor we know and love. The movies opens with Marcia Jeffries (Patricia Neal), who arrives at a small-town jail looking for material for her local radio program. There she finds Larry Rhodes (Andy Griffith), locked up with his guitar, under a week’s sentence for drunk and disorderly conduct. Dubbing him “Lonesome Rhodes,” she convinces him to come host at the radio station. His mix of humor, stories and singing takes off, catapulting Lonesome into national fame. But Marcia finds herself in the role of Dr. Frankenstein as fame goes to Lonesome’s head and he spirals out of control. IMDB tells me this was Griffith’s film debut, and that it has been described as “stunning.” It really is. It was filmed before The Andy Griffith Show, but the context now is unavoidable, and I think it strengthens the movie. While I can’t imagine Andy Taylor ever in jail for being “drunk and disorderly” (actually, that could make a good plot, if it was a mix-up…), Lonesome still seems rather like a rough-edged Andy Taylor when we first meet him. He’s got the accent, the guitar and the big grin–and you can almost ignore the feeling that there’s something just a bit off about his open-mouthed laugh. At the beginning, the movie wants you to like Lonesome, and I think anyone who has seen The Andy Griffith Show will want to like him. He’s funny, he shows unexpected kindness, and he’s a free spirit. But things begin to turn. There’s fear on Lonesome’s face the first time he realizes the influence he can wield over people. That fear comes back throughout the movie–but he starts to like it too. The more his fame grows, the more you can see how it’s corrupting him. The last twenty minutes are the most powerful of the movie. To mostly avoid spoilers, let’s just say that Lonesome’s rising star takes a sudden and dramatic fall. And that’s when Griffith really delivers a stunning performance: raging and heart-broken, contemptuous of his audience while desperately, desperately wanting them to love him again. Walter Matthau delivers a speech in the midst of this that beautifully sums up the terror of a celebrity who sees his fame slipping away. The movie is almost 60 years old, but it still feels so relevant in the modern world, with so much coverage of celebrities self-destructing in terrible ways. Patricia Neal, who I think I’ve only seen before in The Day the Earth Stood Still, has a strong performance as well. Marcia feels a Dr. Frankenstein responsibility for Lonesome–and she gets romantically involved with him–but despite her efforts to help, his corruption drags her down too. She has powerful moments in the final scenes too. I recommend a lot of books and movies, but this one I highly recommend. I also recommend, when you sit down to watch it, build in time for an episode or two of The Andy Griffith Show afterwards. You may find yourself needing an escape to Mayberry! I don’t think I’ve seen Andy Griffith in anything except his TV show. He’s so closely identified with that. I will have to check out this movie. Interesting the turn his career took, though, in that it totally emphasized the small-town, positive character that was Sheriff Andy Taylor. The actor didn’t do much drama, to my knowledge. Maybe that depended on the parts that came his way, though, and, when his TV series took off, that’s where his “image” went, too. Happens to a lot of actors who get type-cast, even if the type-casting is to their benefit. I think this was the first time I saw him in a different role too–so it felt very strange! I hope you enjoy it! I like old movies–and as you say, if they’re new to me, they’re still “new” in a sense!